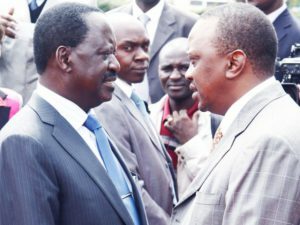 President Uhuru Kenyatta (left) has been asked to draw up a working formula with Cord leader Raila Odinga. The latter however says NASA has not been consulted. Courtesy photo. KENYA–Opposition leader Raila Odinga has dismissed Kenya’s Interim Electoral and Boundaries Commission (IEBC)’s decision to hold fresh polls on October 17. He says the National Super Alliance was not consulted. Raila on Tuesday told Citizen TV that the IEBC set the date yet the thorny issues they raised about the polls body are yet to be addressed. The commission, after a meeting led by Chairman Wafula Chebukati, announced the new dates. This followed the Supreme Court’s nullification of the August 8 presidential election citing violation of the law. The court overturned the declaration of President Uhuru Kenyatta as the winner of last month’s polls following a petition filed by Raila. The election will feature only Uhuru, who is running for a second term, and Raila. The IEBC yesterday announced October 17 as the day Odinga and Kenyatta will face off at the ballot again. IEBC’s decision follows the decision of the Kenyan Supreme Court of Kenya to nullify the presidential results of the poll held on August 8. In the disputed election, incumbent Kenyatta was declared winner by a margin of 1.4 million votes. This is the third time that Odinga is vying for the top seat. He lost in 2007 and 2013, citing vote rigging on both occasions.